My daughter Jenni graduated from UGA in December. While she searched for a job in her field, family financial planning, she started making cakes. She made the first ones with no classes, then took three Wilton cake decorating classes at Michaels. Before she even finished the classes, she had surpassed them with her designs. Here is one she made for my cousin who LOVES Elvis for her birthday party. She used the saying Peggy left on the wall of Graceland when we went to visit on the record label….”Peggy Loves Elvis”. She made the little Elvis by hand and his face and detail were amazing. About the size of a Barbie head, she sculpted the face from fondant and let it dry. Elvis had an open mouth with tiny teeth, tongue and even had his trademark “curled up lip, one sided smile”. She then fashioned his hair and sideburns and dressed him in what we remembered as Peggy’s favorite costume from the exhibit at Graceland, one of the white ones with a cape, bell bottoms and wide belt with gold designs. She put a red scarf around his neck. When it came to the cake, she made it round and then decorated it in black, made to look like a tall stack of old 45 records. I thought this homemade Elvis birthday cake to be one of the “COOLEST” Birthday cakes I have ever seen! I took it to a party for Peggy and another friend who were celebrating May birthdays and it was THE hit of the evening! 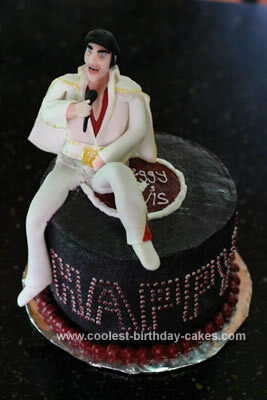 Thanks for posting this Coolest Elvis Birthday cake ever that my daughter Jenni made on your website. She has made so many neat ones already but this one has to be my all time favorite so far!! I was at this party and it was indeed the coolest Elvis cake ever! It was also delicious! Jenni is truly talented and one day we may see her on The Food Network making her cakes for all of TV land! This is amazing. Elvis will never leave the building and is smiling his great smile on this very Happy Birthday celebration cake. I am a very big fan of Elvis Presley. I love him and he is one of my favorite heroes in the world.